Dafydd was the grandson of Llywelyn the Great. He was also the first nobleman in Britain to be executed by being hanged, drawn and quartered for treason. The story is a complicated one and begins with Llywelyn the Great. 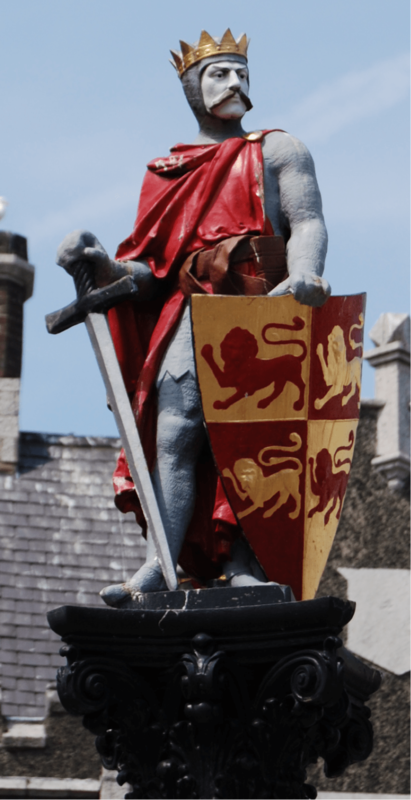 Llywelyn married Joan, the natural daughter of King John. They had one son who inherited his father’s kingdom. He died without heirs so the kingdom was inherited by the heirs of Llywelyn’s other son Gruffydd who had been excluded from a share in the power because of his illegitimacy. This had followed the English way of excluding all but the legitimate heirs. Now though Gruffydd’s four sons all had an opportunity to make a bid for power. In 1256 Llywelyn ap Gruffydd managed to wrest power from his brothers. The early years of his reign were helped by the fact of the Baron’s War in England and the role of Simon de Montfort. Dafydd formed an alliance with King Henry in 1263 and continued to fight against his brother alongside Edward I from 1274. The alliance with King Edward served Dafydd well. He married Lady Elizabeth Ferrers, the daughter of the Earl of Derby and widow of William Marshall (2nd Baron Marshall). He gained land and prestige in England. But then Dafydd thought better of his links with the English and returned to fight alongside his brother. He attacked Hawarden Castle during Easter 1282. Edward was unamused. That same year Llywelyn was killed and Dafydd became the next Prince of Wales. It probably wasn’t a very comfortable position as Edward was hot on Dafydd’s heels. In fact he was captured once but managed to escape into the Snowdonian Mountains. Finally he was cornered along with his younger brother Owain. Also imprisoned were Dafydd’s wife, their seven daughters, two sons and one niece. The King sent him forward to the Tower of London with wife and children….David’s children were condemned to perpetual imprisonment, but David himself was first drawn as a traitor, then hanged as a thief; thirdly, he was beheaded alive, and his entrails burnt as an incendiary and a homicide; fourthly his limbs were cut into four parts as the penalty of a rebel. This all took place in Shrewsbury. As for his wife and children. Their fates are not completely known. His wife is thought to be buried in the church at Caerwys. One daughter, Gwladys, a child, was sent to the Gilbertine convent in Sixhills Lincolnshire where she spent the rest of her life along with her cousin. Her brothers Llywelyn and Dafydd were imprisoned for the rest of their lives. Llywelyn died in suspicious circumstances in 1287 in Bristol Castle. This entry was posted in Anglo-Welsh History, Kings of England, Monasteries, Thirteenth Century and tagged Caerwys, Dafydd ap Gruffydd, hanging drawing and quartering, King Edward I, Lady Elizabeth Ferrers, Lanercost Chronicle, Llywelyn ap Gruffyd, Shrewsbury, treason by JuliaH. Bookmark the permalink.